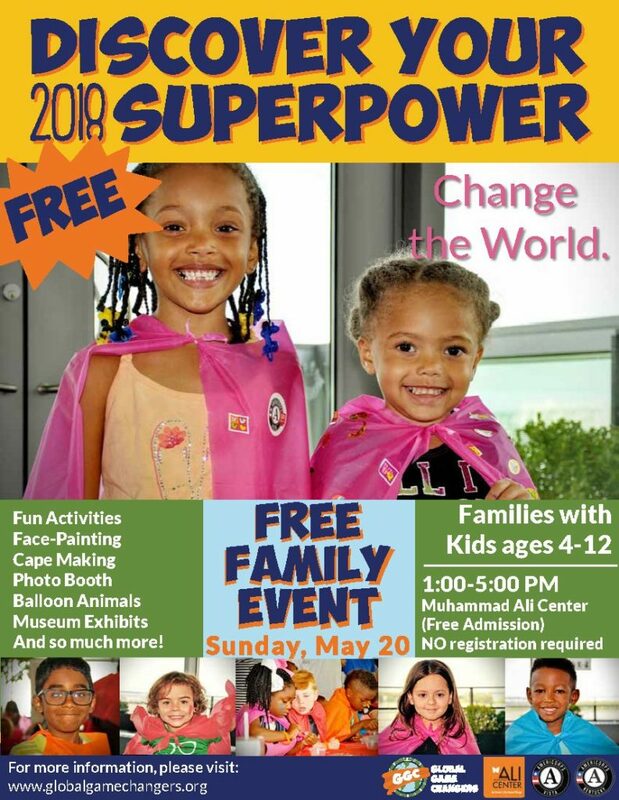 On Sunday, May 20, from 1:00 pm to 5:00 pm, the Global Game Changers Student Empowerment Program, in partnership with the Muhammad Ali Center, will be hosting its 4th annual “Discover Your Superpower” celebration. Families are welcome to come join the celebration at any time throughout the afternoon as the event and admission to the Muhammad Ali Center is free to all families with kids age 4-12. Global Game Changers helps children find their inner superpower by using a simple equation: MY TALENT + MY HEART = MY SUPERPOWER!™ and this event teaches kids how to combine their talents with their hearts to find their real life superpower to give back and help make the world a better place. Families will explore stations hosted by nonprofit community partners so the kids can learn about causes they care about. Then kids will also discover their very own superpower by participating in finding their talents, cape making, face painting, and taking some Superhero photos in the photo booth. Come join us for a Sunday afternoon of fun and empowerment for the whole family that is made possible thanks to a community committed to teach our youth the skills of compassion and kindness!